Bitcoin casino operators BitStarz are launching yet another promotion for slot players called Slot Battles. Much like the Slot Wars available at the casino, this promotion offers a chance for fervid slot fans to earn free spins prizes by competing in selected games. And considering there have been a few cases this and last year where players scored big BTC jackpots, there might also be some nice consolidation waiting those who don’t win anything through the battles. 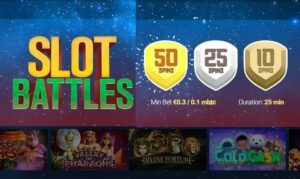 The new Slot Battles promotion is already live at the casino and is aimed at any player that likes slot tournaments but doesn’t want to wait too long to reap the benefits of competing. For this purpose, BitStarz have created a special tournament format that offers a fast turnaround and 48 daily shots at grabbing free spins prizes. Every battle round is 25 minutes long and plays out five minutes after the previous one, giving you a chance to claim any of the six free spins prizes every half an hour. The prize pool is 100 free spins per each battle round, or a total of 144,000 free spins every month. The order of the prizes if 50 free spins for the 1st spot, 25 free spins for the 2nd, 10 free spins for the 3rd, and 5 free spins for the 4th, 5th, and 6th place. To enter a battle, all you have to do is press the Slot Battles button, play the selected slots, and you’ll automatically get your prize during the 5 minute break if you are successful. The free spins prizes are given on a point basis, with the highest point earners being the top contenders. As for the points themselves, the higher your win in relation to your bet, the more points you will get during the battle. 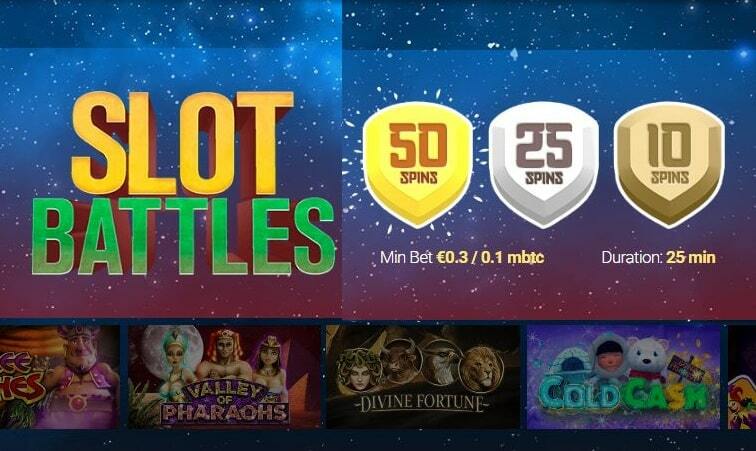 Apart from the Slot Battles, which are your daily slot tournaments, BitStarz casino also has a weekly Slot Wars promotion where a bigger prize pool of €1,000 is offered along with 250 free spins. Naturally, the competition will be much stiffer in this tournament, since the free spins and money are divided between the top 50 players, according to how many points they’ve collected. But unlike the Slot Battles, you don’t have to do anything to enter the tournament, but just play as usual in the casino. There is only one rule though – no table game wagers will result in points. But if you play slots, each dime you spend will be turned into tournament points for the leaderboard. The leaderboards are updated every hour, so you can see exactly what spot and prize you are competing for. If you’re a Bitcoin slot player and want to check out the tournaments, you can do so by visiting this link.